I'm delighted and honored to announce that two of my photographs will be included in a 200 Yards exhibition of 15 photographs at the Sweet Adeline Bakeshop, 3350 Adeline St. @ 63rd, Berkeley, CA, 510-985-7381. There will be an opening reception on Saturday, October 6, 2012 from 6:00-9:00 p.m., and the show will run for about a month. 200 Yards is a series of exhibits consisting of photographs made within a 200-yard radius of the show's venue. It will be fascinating to see the different artists' perspectives on the 200 yards surrounding Sweet Adeline! If you're in the area, I hope you'll join us for the opening! Congratulations, Jackie! 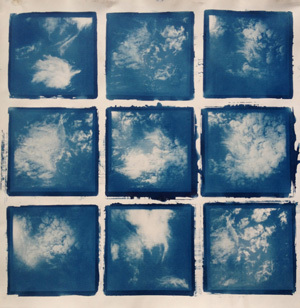 Love that grid of cyanotype images. Thank you so much, Paul! Love 'em both! The cyanotypes are very nice. Thank you very much, Carol! They're both deserving images. I love that cyanotype layout. Thanks so much, Jim! I'm feeling encouraged to try more of that. Animals, F-Stop Magazine, 94, online, April-May 2019. Wanderlust, Analog Forever magazine, online, March 18, 2019. Falling Through The Lens with J. M. Golding [audio interview], Sunny 16 Podcast, episode #136, January 31, 2019. Fading Light, Shots magazine, Winter 2019, issue no. 142. 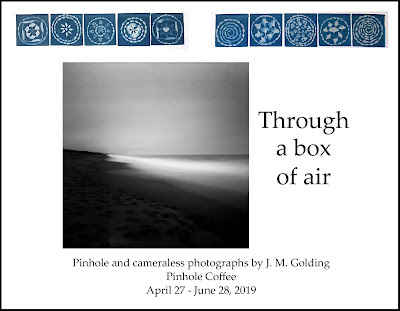 Through a Box of Air (solo exhibition), Pinhole Coffee, 231 Cortland Ave., San Francisco, CA 94110, 415.728.2120, April 27 - June 28, 2019. 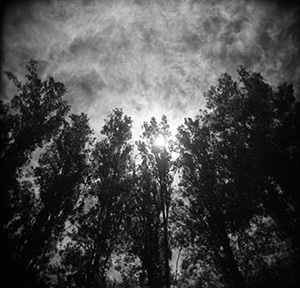 Reception on Worldwide Pinhole Photography Day, Sunday, April 28, 2019, 6:00 - 8:00 p.m. Some of my photos are available as note cards and postcards at my Redbubble shop. At a photographic workshop years ago, the instructor encouraged students to “fall through the lens.” Although I’m sorry to say that I no longer recall which instructor said that, or what else happened at that workshop, I’ve carried those words with me. Falling through the lens (or the pinhole) means allowing myself to be drawn to or moved by what I see, to experience its emotional and symbolic significance for me in that moment (even if that content isn’t readily accessible verbally), to become absorbed in the process of making a photograph – a silent interaction between me and the scene before me. I hope that my photographs will convey experience as it’s lived subjectively, especially in the dreamlike moments that we may not always notice as we go about our lives. All of the photographs on this site are protected by copyright and may not be used in any way, for any reason, without my specific written permission. From "Before there were words"